Too often, when struggling to find just the right turn of phrase, exclamation of joy, or witty barb, it's easy to forget that history is positively brimming with rich words deserving of rejuvenation. Lesley M. M. Blume gathers forgotten words, phrases, names, insults, and idioms, plus fascinating and funny anecdotes, etymologies, and occasions for use. 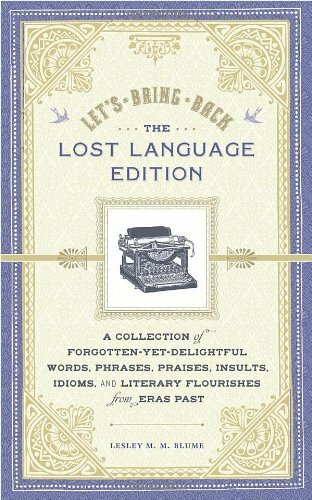 Let's Bring Back: The Lost Language Edition takes readers on a philological journey through words from the not-too-distant past. From all-overish to zounds, the vintage vernacular collected here will make any reader the cat's meow among friends, relations, and acquaintances. If you have any questions about this product by Chronicle Books, contact us by completing and submitting the form below. If you are looking for a specif part number, please include it with your message.